We have been waiting many years for some Commonwealth AFV crews to be released in plastic. In a short space of time we have gone from famine to feast, with MiniArt giving us several useful sets and now Master Box with their Desert AFV Crew. This is a brief look at set No MB 3564 British and Commonwealth AFV Crew, sculpted by A. Gagrian with the illustration drawn by A. Karaschuk. The set is packaged in a standard Master Box figure type box. On the front is a picture of what you get and on the reverse are the build instructions for the figures, a tree layout of the sprues and a suggested painting guide using 6 of the widely used paint manufacturers. The box is in full colour and the sprue shots show the number of each part to correspond with the build instructions opposite. • 1 ‘Monty’ type figure. • An Arab mounted on a camel. The figures are on two sprues of tan/yellowish plastic. There are no part numbers on the sprues but the parts are pretty self explanatory and they are shown clearly on the reverse of the box if you need to check. Sprue A contains 4 figures, so let’s have a look at what you get. This is an AFV Crew man in a semi seated position. The figure is in 10 parts with separate head(s), legs, arms, pistol holster, ammo pouch and goggles. The figure is dressed in KD shorts and shirt, with hose and putties. The putties are wrapped the wrong way around the boots with the end facing forwards rather than back. My old RSM would not have been impressed, although I have known the odd person to get them wrong, much to their regret!! The KD shirt appears to be of the early type with the 3 buttons and pleated pockets, the shorts seem appropriate too. Around the lower waist is a 37 pattern pistol belt and holster in the early long RAC style. No buckles are present on the reverse of the belt and as the figure is bent forward no front brasses are visible. To add to that you get a reasonable representation of the early open style pistol holster with the 6 rounds running down the holster and the pistol handle present. The arms are shown with the shirt sleeves rolled up, the left arm being designed to sit on the left knee with the right arm raised slightly, perhaps resting on a hatch. The figure is in a relaxed mode smoking a cigarette which is shown in his left hand. 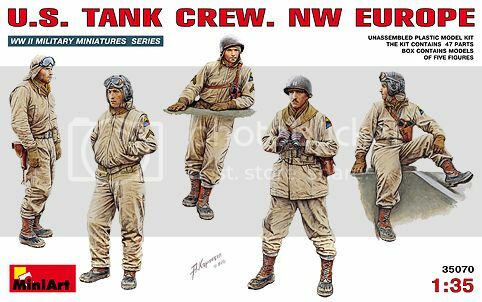 There are two heads to choose from to complete the figure, one with a tankers beret and the other wearing the early style of tankers helmet, so some choice there. Both heads have smiling faces which look fairly well detailed and should paint up OK.
To finish off the build you get a pistol holster as already mentioned, a small ammo pouch and a pair of goggles to fix around the figures neck, but you would need to do this as you add the head. These parts are well done with the small stud on the ammo pouch with the strap shown holding the pistol in place. This figure is wearing 39/40 battledress and eating with a spoon from an open can. The figure consists of 9 parts; the upper torso, separate legs and arms, head, pistol holster and small ammo pouch and an open can lid. The figure is dressed in Battle Dress Serge 39/40, the tunic has the pleated pockets and the trousers show the correct pockets in place. The trouser legs hang to the bottom of the leg, no putties or anklets being present with a pair of ammo boots that complete the main parts of the uniform. The left leg is bent slightly and the figure is designed to be leaning against something. Around the waist is a 37 pattern belt, the front brasses are reasonably well defined and again no buckles are shown on the rear of the belt. Moulded to the side of the right leg is the strap for an early style pistol holster. The uniform looks well done, with nice folds and creases present. The arms come with sleeves rolled down and look to have the correct cuffs. The right arm and hand is shown holding a spoon, and in the left a can of some delicacy. Moulded onto the right and left arms are a set of sergeants stripes. The head shows the face of a mature man with mouth open, tankers beret and moulded on goggles. The facial detail looks good. To complete the build you get an early style pistol holster, ammo pouch and open can top to add to the can in the left hand. This is the Monty type figure which is very reminiscent of the old Italeri style figure. Posed standing in light weight jumper and trousers he too is having a cuppa. This time consisting of 6 parts; torso, arms, head and separate legs. The uniform is based on wartime pictures of Monty and looks appropriate. The left arm is designed to be partly inserted into the left hand side trouser pocket. The right arm holds the tea mug. The head also a separate item has a very good facial likeness to the General, the beret supports two cap badges and the head should paint up very well. His mug of tea would need the top drilled out. Again depicted in a standing pose, this figure consists of 13 parts; upper torso, legs, arms, head, small back pack, water bottle, left and right ammo pouches, the head, a turban. To equip the soldier you get a fair representation of the SMLE rifle complete with a separate No 1 long bayonet in its scabbard. The figure is dressed in 39/40 Battle Dress Serge and all the correct pockets seem to be in place. The upper torso comes with a 37pattern belt and shoulder straps moulded on. The belt has nice brasses on the front, and the buckles are present on the front and rear of the shoulder straps. Anklets and ammo boots complete the figure. The uniform has nice folds and creases so should paint up well. Supplied with the figure is a small back pack, but no straps or shoulder brasses are provided so you would have to add your own. The arms which are also separate items come with the sleeves of the DB rolled down. There is cuff detail present and the right arm is designed to rest hand on hip whilst the left is designed to be raised in the act of giving or receiving something, giving him a rather ‘jolly’ appearance. The head is in two parts, the lower facial details that show the face of an Indian soldier with a moustache and a separate Turban for his head. Both items look neatly done. Equipment for the figure consists of 2 ammo pouches, a small back pack, Short Magazine Lee Enfield, No 1 bayonet and water bottle. All these items look to be well done and pretty accurate. A little clean up of flash and seam lines will be necessary, but these troops look good. They provide a nice mix for a N Africa or Italy diorama and a couple could easily be used in NWE. Facial detail is very good for plastic figures and the uniform and equipment detail is very well done too. Sprue B consists of an AFV Crewman, Camel and mounted Arab. This figure comes in 6 parts consisting of the head, upper torso, separate arms and legs. The figure is dressed in KD shirt and shorts and is designed to be shown in a kneeling position. The uniform detail looks good and hose, putties and ammo boots complete the uniform. No belt is present. The left arm is designed to be out stretched offering a tasty morsel, and the right holds a mug of tea. Shirt sleeves are rolled up. The head shows that of a happy, smiling mature man. Detail is good but there is a little more flash present on this one. The head also wears a tankers beret, again the cap badge is depicted nicely. No other equipment is provided for the figure. This figure is designed to fit the camel provided in the set. A simple 6 part figure shown dress in a long flowing robe. This time the head comes moulded as part of the upper torso and is depicted wearing a turban. A small curved dagger is also provided for this figure. The robes look nicely done as does the head, and this should be a fun figure to do and also useable from ancient history to the present day. Well, camel expert I am not although I encountered a few in the desert. The animal is made up of 9 parts, two half parts make up the main body and legs, added to that are the neck/head, tail, ears, and a 3 piece saddle to sit the Arab figure on. Part of the saddle and under blanket are also moulded to the animals main body. The camel looks pretty well done as far as I can tell. The rough hairy areas are present where they should be and this too should be a fun item to build. The saddle is a three part affair and shows nice tassels hanging down each side. The box art and the Master Box site show either the kneeling AFV figure or Indian Soldier engaging with the camel and mounted rider, but if I remember correctly camels tend to belch, spit, bite a lot, and generally behave in an unruly way…so rather you than me. That said they are a prized item in the Middle East, capable of withstanding the scorching temperatures and well adapted to desert life. This one and its rider should make an interesting addition to any Middle Eastern type build you are thinking of, or alternatively be quite useable as a stand-alone figure. So here we have a 3 man AFV crew from Master Box with a few nice additional items included. There is good variety of uniform and dress style within the set, each figure is individual in its own right, there are alternative possible uses for several of the figures. It’s great to see some more plastic AFV crew, I do like the addition of the Indian Soldier and the camel and rider. Even Monty, who although very similar to the old Italeri figure, stands out because of the good facial detail. There should be many uses for this set for vehicle builds and diorama builders alike. Normal clean up will be required as with all plastic figures, but these are a very credible set and should find many uses. Highs: Good detail, variety of individual uniform types and possible uses. A strange comment to make on this review but I really like the detail they have put into the camel and its rider, which should really add to the interest in this product due to the possibilities.